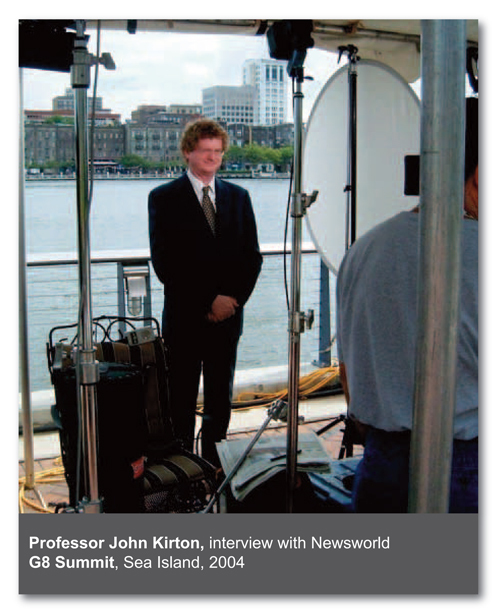 John Kirton is professor of political science and co-director of the G20 Research Group and director of the G8 Research Group, as well as co-director of the Global Health Diplomacy Program, all based at the Munk School of Global Affairs at Trinity College in the University of Toronto. He has advised the Canadian and Russian governments, the World Health Organization and the International Bankers’ Federation on G7/8 and G20 participation, international trade and sustainable development, and has written widely on G7/8 and G20 summitry. 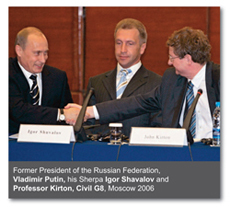 Professor Kirton is co-editor of several publications dedicated to the G8 and G20, including G8 & G20: The 2010 Canadian Summits (Newsdesk, 2010), The G20 Pittsburgh Summit 2009 (Newsdesk, 2009) and G8 2009: From La Maddalena to L’Aquila (Newsdesk, 2009). His most recent publications also include Rising States, Rising Institutions: Challenges for Global Governance (edited by Alan S. Alexandroff and Andrew F. Cooper, Brookings Institution, 2010), Making Global Economic Governance Effective: Hard and Soft Law Institutions in a Crowded World (edited by John Kirton, Marina Larionova and Paolo Savona, Ashgate, 2010), Innovation in Global Health Governance: Critical Cases (edited by John Kirton and Andrew F. Cooper, Ashgate, 2009) and Canadian Foreign Policy in a Changing World (Thomson Nelson, 2007). 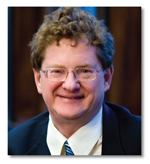 He is also co-editor of three book series published by Ashgate Publishing, including the Global Finance series and the G8 and Global Governance series, and editor of Ashgate’s five-volume Library of Essays in Global Governance.